During a recent road trip to Vermont, my son Alex and I listened to an audiobook that was set in Maine. The narrator described a local drink in that region called Moxie (Pronounced Mawwksey, in their native tongue). My son asked was curious about it, so I told him to look it up on the Wikipedia app as we drove (see, technology is actually a good thing!) This opened up a conversation about local drinks that are specific to regions of the country. I explained to him that these beverages usually have characteristics of their region of origin, and are widely popular to the small portion of the population they serve. Growing up in South Jersey, we had a local drink that was only sold in our region. It went by the name “Drinka-Toast” or “Tak-Aboost”. It was our local claim to fame! I remember stories my grandmother and her sisters would tell us about going to their local Five and Ten in the 1930s, and Drink-A-Toast was the “bees knees!” It was quite the bargain at 2 cents per cup! 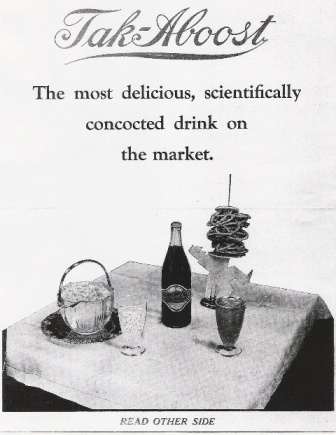 Turns out a local pharmacist named Ben Faunce invented this regional beverage and trademarked it in 1913. I couldn’t get enough Tak-Aboost as a child. It basically tastes like Cola without the carbonation. Mr. Faust’s pharmacy included a soda fountain, and Tak-Aboost was frequently mixed seltzer, milk, or poured on ice cream as a topping. Much like hiding under the kitchen table and dreaming, this drink is a comfort that brings memories of a simple time. It is still sold in our local South Jersey supermarkets (now simply called “Boost”) and continues to have a cult following. The older generations remember it fondly and will regale you with tales of yesteryear, sitting around the pop shop and wasting time. As we drove through Vermont on this day, we stopped by a gorgeous fall festival in the town of Peru, Vermont. The autumn leaves were full of splendor, falling about onto rows of white tents that lined the country streets of town. Vendors were everywhere, selling homemade chowder (Chowdah), local wares and crafts, and – you guessed it – the local Vermont beverage! We passed a few vendors selling a concentrate called “Switchel” before finally stopping and asking a few questions. Two young college-age men (who were appropriately clothed in what seemed to be the uniform in Vermont– plaid flannel shirts and dungarees!) told us about Switchel. Switchel originated in Vermont in the 1800’s. It is a mixture of apple cider vinegar, Vermont maple syrup, ginger and lemon. Yes, you read those ingredients correctly. The purpose of this drink was to energize farmers as they worked dawn till dusk. They would typically make up a big jug of Switchel in the morning and drink it throughout the day. Since Alex and I had been discussing this topic earlier in the day, I asked these nice young men if we could try a sample. They happily obliged and poured Alex a small cup. He sniffed it apprehensively, but to his credit he was very brave. As he brought the brew to his lips, I saw the men nudging each other and laughing out of the corner of my eye. As Alex began tilting his head back slowly, we all began chanting “Chug! Chug! Chug!” as if we were at a college frat party. Alex took a big gulp, and we all held our breath, waiting for his reaction. Time seemed to stand still. Almost immediately, he coughed and spit the drink out onto the leaf covered street! Somehow my 11 year old did not enjoy the taste of vinegar mixed with ginger and maple syrup. I know, hard to believe! The men admitted that Switchel is an acquired taste. To make it up to him I purchased a big maple syrup ice cream cone to cleanse his abused palette, and our relationship was mended after what we now call the Switchel Experience. Later on during this same road trip, we were wandering through the Vermont countryside dotted with only small villages. It was beautiful and serene. After driving a pretty good distance without seeing many signs of life (which we were not complaining about! ), we came upon a small country store. We realized we were quite hungry! The owners made us fresh country egg and bacon sandwiches, and we perused the cooler in search of a drink to go along with it. Wonder of wonders – what did we find on the shelves?? Cans of Moxie – the beverage noted in our audiobook that started this whole adventure! Of course we had to buy some! To the proprietor’s credit, they did warn us ahead of time that this is not a tasty treat. “No one likes it,” they told us. Of course I had to laugh, because why did they sell it? Alex and I had spent all our courage on the Switchel experience, so we brought home the can of Moxie to try on my husband and son. Just like Switchel and Taka-Boost, this drink is an acquired taste. According to Wikipedia, Moxie originated in 1876 and was touted as a medicine that was effective against some neurological conditions. The drink is made from a root extract that is actually quite rare and was rumored to have health advantages. Finally, we convinced our family members to give it a shot. “It tastes nasty!” noted my teenage son, Ben. “Eww! Tastes like bitter carbonated bubblegum!” my husband spat. A Google search shows there are many different varieties of Local brews all over the country. We would like to try them all! In Union, Maine, there is even a Moxie museum with a 30 foot tall shrine to the local drink. I think I know where we will go on our next road trip! 0 Comments To "Local Potions"